A handrail gives you something to grip onto when ascending or descending stairways. Every stairway needs a sturdy handrail, as the stairway is the cause of a large percentage of accidents in the home. You can install a strong hand rail on your stairway with normal carpentry tools in about half a day. To assemble a sturdy handrail, build your handrail only from code-approved materials available at home improvement stores. Find the studs in the wall above the stairs where the handrail will be installed using a stud finder. Use a measuring tape and a level, and mark the stud locations with painters' tape placed vertically about three feet above the stairs. Use a level and plumb from the edge on the top step and make a pencil mark at 36 inches on the wall. Do the same on the bottom step. Lay the handrail across the edge of the stairs so that one end is resting on the floor. Mark the handrail with a pencil where it rests on the edge of the top step. Cut the handrail on this mark with a circular saw or a miter saw using a 90-degree cut. 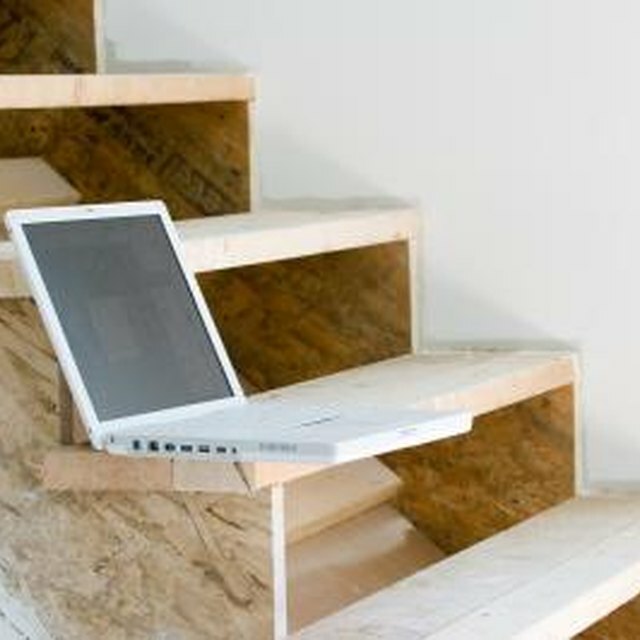 Use a helper and hold the handrail against the wall on the 36-inch marks you made at the top and bottom steps. Mark the tape on the wall (stud locations) with a pencil at the underside of the handrail. Remove the handrail. Hold a hand rail bracket vertically at the stud mark closest to the top stair. Hold the top of the bracket even with the pencil mark on the tape, and drill wood screws through the bracket and into the stud with an electric drill and a Philips head attachment in a clockwise direction. Mount a handrail bracket on the stud closest to the bottom stair in the same fashion. Remove the painters' tape before completely tightening the screws. Set the handrail on the two brackets. Use a measuring tape and make sure the overhang at the top and bottom is the same. Attach the handrail to the brackets with the strap and wood screws provided with the bracket. Turn the screws in with a Philips screw driver in a clockwise direction. Install the remaining handrail brackets on the painters tape marks at approximately every three feet. Do not install a bracket on every marked stud. Hold the bracket on the tape marks vertically so that it touches the bottom of the handrail, and install the holding strap and wood screws with a Philips screw driver in a clockwise direction. Remove the painters' tape from the wall. Before purchasing a handrail, measure the approximate length need by measuring from the front edge of the top and bottom steps and add about two feet.